Now in its third year, One Book, One Province Saskatchewan is a province-wide rea ding initiative that encourages Saskatchewan residents to read, discuss, and engage in programs around a selected title and, by doing so, create community. The essence of the project is to encourage Saskatchewan people to read the same book during the month of March, 2019. 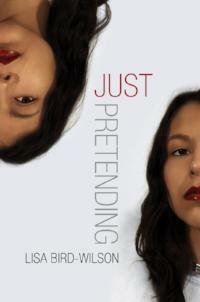 The Saskatchewan Library Association (SLA) is pleased to announce that the 2019 One Book, One Province Saskatchewan selection is Just Pretending, a short story collection by Lisa Bird-Wilson. We would like to invite you, as a cultural organization in this province, to partner with us. Participation could include: forming a book club or discussion group, mounting a display, creating responsive artwork, or any project that invites discussion about the book. While SLA cannot provide funding to assist with your project, we will acknowledge your organization on our website using your logo and promote your project through our communication channels, including social media and a monthly newsletter that reaches over 1500 people and organizations. A nitanis (daughter) invents the mother she never knew. A fourteen-year-old girl struggles to come to terms with her feelings of abandonment. A young man struggles with his Mooshum's imprisonment in a damaged body and what it means for his own Métis identity. A department store clerk falls for a homeless man who woos her with Heart of Darkness. Timely and thought-provoking, we are certain that Just Pretending will provide food for thought and that Saskatchewan residents will reflect on their own identity and that of those around them. Lisa Bird-Wilson is a Saskatchewan Cree-Métis and nêhiyaw writer whose work appears in literary magazines and anthologies across Canada. Her collection of short stories, Just Pretending (Coteau Books), was a finalist for the national Danuta Gleed Literary Award and won four Saskatchewan Book Awards, including 2014 Book of the Year. Bird-Wilson's debut poetry collection, The Red Files (Nightwood Editions 2016), is inspired by family and archival sources and reflects on the legacy of the residential school system and the fragmentation of families and histories. Bird-Wilson is currently working on a new book of fiction.